Are You at Greater Risk of Dying in a Motorcycle Accident in Texas? While riding a motorcycle can be exhilarating, it can also become deadly if a negligent driver hits you. Unfortunately, the risk that a motorcyclist will be killed in an accident is increasing, not decreasing. According to the Governors Highway Safety Administration (GHSA) study of preliminary data, motorcyclist deaths rose by 10 percent in 2015 from 2014’s final figures. In Texas, the increase in fatalities was only one percent, with 455 deaths. However, Texas had the third highest number of deaths nationwide behind only Florida and California in 2014 and was expected to continue in this deadly spot in 2015. What Are the High Risk Factors for Being Killed in a Motorcycle Accident? Motorcycle helmet use. While Texas allows adults 21 years old and older to not wear a motorcycle helmet, failing to wear a DOT-approved helmet significantly increases a rider’s chances of dying as well as suffering a more catastrophic injury in a crash. Alcohol use. Whenever a person drives after consuming alcohol or drugs, his reaction time and general driving abilities are reduced, with tragic wrecks being the result. Unfortunately, the problem is not only with passenger vehicle and truck drivers. Motorcyclists also cause these crashes when riding their motorcycle while intoxicated. Speeding. Whenever a driver is speeding, it increases the chances that someone will suffer life-altering injuries or die because the force of the impact is greater. Speeding on a motorcycle is also dangerous, and riders who own sport and super sport motorcycles are more likely to speed. Invalid drivers’ license. It is illegal to drive in Texas without a valid drivers’ license. Not having a valid drivers’ license is a common problem in collisions where motorcyclists are killed. 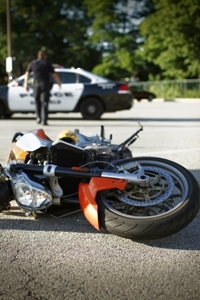 Were you hurt in a motorcycle accident caused by a negligent driver? Start an online chat to schedule a free case evaluation with one of our experienced motorcycle accident attorneys.